This unit is designed to automatically compact soil samples rapidly and produce a uniform degree of compaction. The results compare favorably with hand compaction samples. 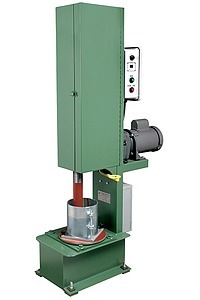 For standard or modified compaction tests with arrangement for 12" and 18" height of drop. The hammer is lifted from the bottom so no rod or cable is attached to the end of hammer. The weight is concentrated at the foot allowing free fall of the hammer. The hammer weight is adjustable from 5.5 lbs. to 10 lbs. to accommodate 4" and 6" molds. A digital counter registers the number of blows per compaction and is pre-set to stop the machine. A start-stop switch controls starting and stopping independently from counter control when desired. A compaction mold is mounted on a round base. The round base rotates automatically with each blow assuring the entire area of the mold is covered during the compaction cycle. 1 - 5.5 lb. sector faced hammer w/wgt to make 10 lbs. 1 - 4" standard mold 1/30 cu. ft.
1 - 6" standard mold 1/13.33 cu. ft.